Learn where Richard Bunck stands on the issues. With so many important issues Apple Valley, Richard Bunck wants to make sure there’s no confusion on where he stands. But first, he would like to state clearly and unequivocally that he believes in equality, fairness, and inclusion for all. Every Apple Valley resident deserves safety, prosperity, and the chance to achieve their American dream. Don’t be misled by Special Interest attacks! Special interests and career politicians don’t want independent Richard Bunck on the town council. They are spending tens of thousands of dollars to defeat him so they can control city government. Richard Bunck is not a member of any political party, he is an independent. That independence means he is accountable to you – not political party bosses. Richard’s independence means he will put Apple Valley – not politics – first. Richard Bunck stands for equality: Special interests are trying to attack Richard Bunck for alleged actions that occurred in the 1970s, when bell bottoms, leisure suits, wood paneling, and disco was in style. Please don’t be fooled! 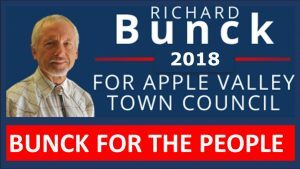 Richard Bunck is standing for Apple Valley Town Council to improve the quality of life for everyone – not serve special interests or big money political donors. Keep your eyes on this space as Richard Bunck focuses on the issues and setting the real record straight.